Address growing consumer demands for all-natural products by launching the company’s first cosmetics line of products. Leverage consumer content and sampling as a critical element of the marketing strategy. High review volume at time of launch, supporting sales in the retail channel and in gathering early product feedback. Within just two weeks, 94% of those who received a sample submitted a review, resulting in more than 300 reviews with a 4.48 average star rating. In today’s crowded marketplace, consumers are bombarded with marketing messages from all sides. It’s harder than ever for a brand to stand out, especially in a new product category. Consumers have access to an unprecedented amount of choice for what to buy – and they expect to find lots of information about products to help them decide. Across categories, shoppers research products before making purchases, and in today’s right here, right now economy, they do so faster than ever before, both in the store aisle and online. One key information source they trust: the opinions of people like them. Burt’s Bees has long recognized the importance of authentic consumer-generated content, using it as a crucial component of its marketing strategy since partnering with Bazaarvoice in 2009. Naturally, when they planned to break into a new product category, consumer content was a critical element of their strategy. A growing number of consumers care about what they put into and on their bodies and seek out all-natural products. Recognizing this trend, Burt’s Bees identified cosmetics as a significant growth opportunity for the brand well-known for its high-quality, inexpensive natural personal care products. This launch of makeup products represented the biggest brand extension in the company’s history – and they had to get it right. The company looked to its thriving CGC program to help fuel immediate success. We knew reviews could be insurance for new products, and that early qualitative feedback and star ratings would ensure a smooth transition into a new market, said Taylor Steele, Assistant eCommerce Manager at Burt’s Bees. To collect plenty of high-quality consumer content early, Burt’s Bees turned to Bazaarvoice Sampling to get pre-released products into the hands of consumers and collect feedback. Taking this step yielded advance insights about how the products were received, and gave them reviews in place as the products became available at retail stores. Within just two weeks, 94% of those who received a sample submitted a review, resulting in more than 300 reviews (37-41 reviews per product) with a 4.48 average star rating. Bazaarvoice Sampling proved cost-effective and easy to use, as well. We had an issue where our in-house sampling program wasn’t as effective as we might have liked. It was time-consuming and very costly, said Steele. Bazaarvoice’s solution addressed all the issues we had with our own and at a much lower cost. Collecting so many reviews also drove success in Burt’s Bees retail channels. Burt’s Bees distributed review content to its retailers across the Bazaarvoice Network, for display on product pages at their retailers – in advance of the product launch. The greatest thing was that when lights went on with cosmetics, our reviews were syndicated to 15 key retailers, said Steele. Burt’s Bees now has several thousand reviews for makeup products across retail sites. Burt’s Bees used the CGC they collected to surface opportunities for improvement on their own website. This was the first time burtsbees.com would play a huge part in the launch period. Gathering learnings and understanding our customers and their shopping behaviors based on early feedback helped inform changes to our site that made it easier for cosmetics customers to find what they were looking for, said Steele. For example, Burt’s Bees identified the need to add a foundation shade finder tool, making it easier for customers to pick the right product based on skin tone. The company also revamped product description pages, adding larger product images and moving star ratings higher up the page to increase visibility of CGC. In the past, we were not as shopper-focused. We knew we needed to better the shopper experience and that stars were important to customers, said Steele. We needed to put stars right in front of their faces because they need to know what others are saying right away, and from there, each shopper could dive into specific reviews. 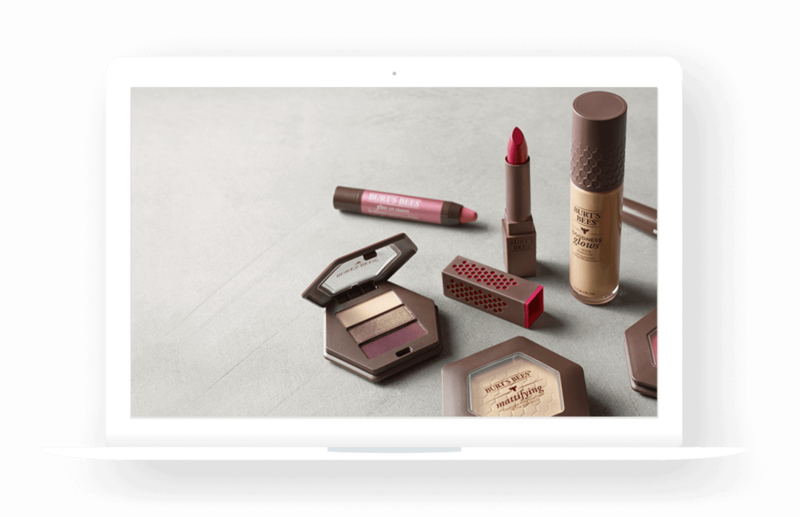 Within six months, cosmetics accounted for 21% of all sales on the brand’s site. Shoppers who engaged with reviews showed a 16% incremental conversion lift and a 20% increase in revenue per visitor. Burt’s Bees cosmetic buyers are also among the most valuable customers, as return cosmetic shoppers represent the site’s highest average order value. CGC served as a critical tool in establishing Burt’s Bees as a major cosmetics brand, and the company plans to grow its position in the category by releasing more makeup products. We have a partner in Bazaarvoice that we’ll continue to turn to as we start selling even more products our customers will love, said Steele. Burt’s Bees is a leading provider of natural health and beauty care products. We have a partner in Bazaarvoice that we’ll continue to turn to as we start selling even more products our customers will love.